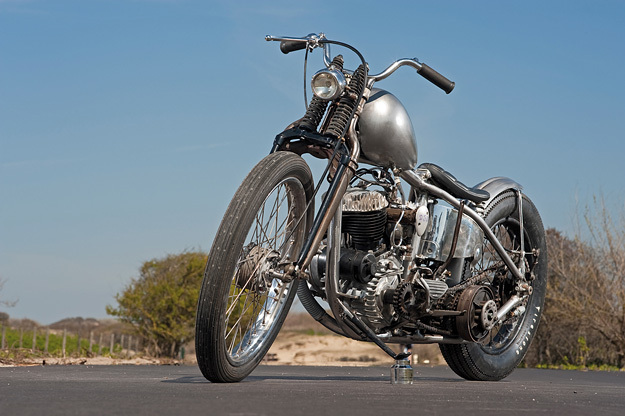 Philip Van Geest runs Dark Star Kustoms in The Hague, Holland, and he’s making a name for himself with his fabricating skill and eye for good proportions. 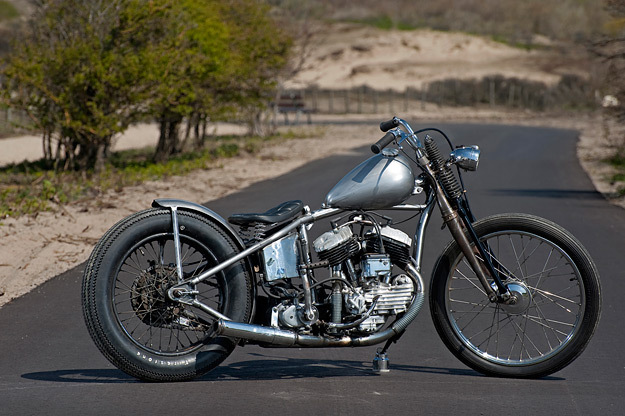 This Harley WL bike is called ‘The Merlin’, and it’s the star of the latest issue of Greasy Kulture magazine. The handlebars are from a Belgian ‘Flandria’ moped, the headlight from a bicycle and the petrol cap from an East German ‘Stimson’ moped. The primary chain cover once did duty as a step on a Russian sidecar, and the rear wheel is from a pre-unit Triumph … you get the idea. The engine is a 1942 Harley-Davidson WL (750cc flathead) which Philip got in exchange for a BMW bike. (The “engine was scrap metal” he says, and it had to be rebuilt). But the rest of the machine is almost all handmade from scratch by Philip: this includes the frame, the neat little tank, and the ribbed mudguard. 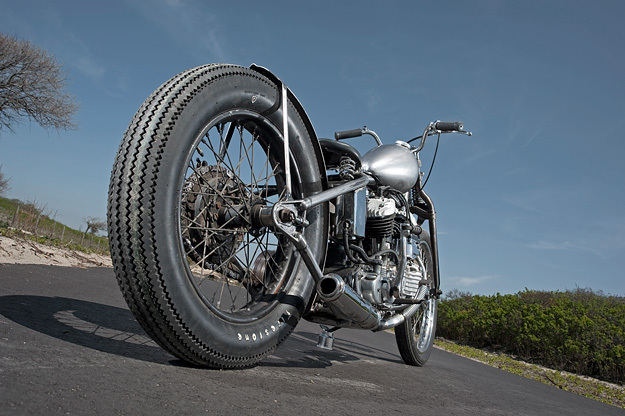 According to Greasy Kulture editor Guy Bolton, “Philip appreciates period correctness and has a definite idea about what ‘old school’ choppers should look like, dressing his bikes with pre-1950s accessories. “He also mixes and matches parts from different marques to put a twist on the usual Harley custom theme.” Philip’s intention was to create “a really skinny bike suitable for the hectic traffic in The Hague … I couldn’t decide which colour would fit the bike, but it actually looked cool as it was: bare metal, really pure. “All I’ve done is spray some lacquer over the metal to keep the rust at bay.” This Harley took just five weeks to build: fast work is a Dark Star trademark, which is amazing when you consider how much this Harley was handmade from scratch.